Only a two-and-a-half hour drive northwest of Mexico’s capital lies the colonial city of Santiago de Querétaro, a one-million-strong metropolis that contains just as much culture, historical relevance, and delicious food as Mexico City, but has long been overlooked by international visitors. Commonly referred to as Querétaro City, Santiago de Querétaro is regarded as one of the safest cities in the country with the best quality of life, and its economy has been on the upswing since the 1990s. With considerably better air quality than the capital, it’s no wonder that more and more people are relocating here every year from Mexico City. When arriving by car, your first glimpse of the city reveals row upon row of striking white-washed houses, as the whole metropolitan area stretches out before your eyes in a vast, open valley, lesser in extent but similar to the Valle de México which cocoons Mexico City. In the core of Querétaro City you’ll find one of the most charismatic and historic areas, the colonial Old Town, which was named a UNESCO World Heritage Site in 1996. Made up of a network of pedestrian-friendly, winding cobblestone alleys (which are remarkably clean), these narrow lanes are lined with street vendors, cafes, and a mix of upscale and affordable restaurants while giant plazas, looming cathedrals, and interesting museums like the Museo de Arte Sacro (Museum of Sacred Art) are only steps away. In Jardin Zenea, one of the main squares in the Old Town, you’ll often find bands or orchestras playing on a raised gazebo during weekends and holidays. Locals love to dance, and you can bet the plaza will be filled with couples of all ages practicing their moves, while others bring foldable chairs to simply enjoy the live music and watch the dancers. In this relaxed atmosphere, it’s easy to admire the love and appreciation Mexicans have for music. 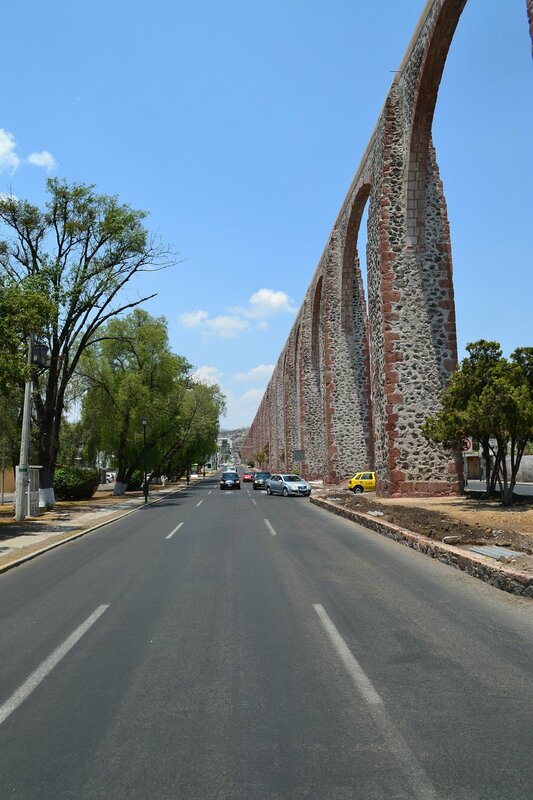 Just outside the perimeters of the Old Town stands one of Santiago de Querétaro’s most distinctive and old-world landmarks, a gigantic aqueduct that runs almost two kilometers long. Built in the 18th century, this massive structure formerly brought water to the city’s residents. Today, it’s a vital piece of the state of Querétaro’s heritage, and it is still used to transport water to the fountains located in the Old Town. It’s fascinating to admire the architecture by day, but even more spectacular at night when the entire structure is lit up by colored lights. There are plenty of restaurants and bars close by where you can dine on tacos and mezcal with a view of the illuminated aqueduct. To step back further in time, head to the southern suburb of Corregidora. There you’ll find the well-preserved archaeological remnants of El Cerrito, a Mesoamerican pyramid and place of worship which dates back as one of the first human settlements in this area of Mexico. Like the city itself, these ruins remain essentially undiscovered among tourists and the site is relatively quiet (unfortunately, tours are only available in Spanish at this time, unless you can arrange your own private guide who speaks English). 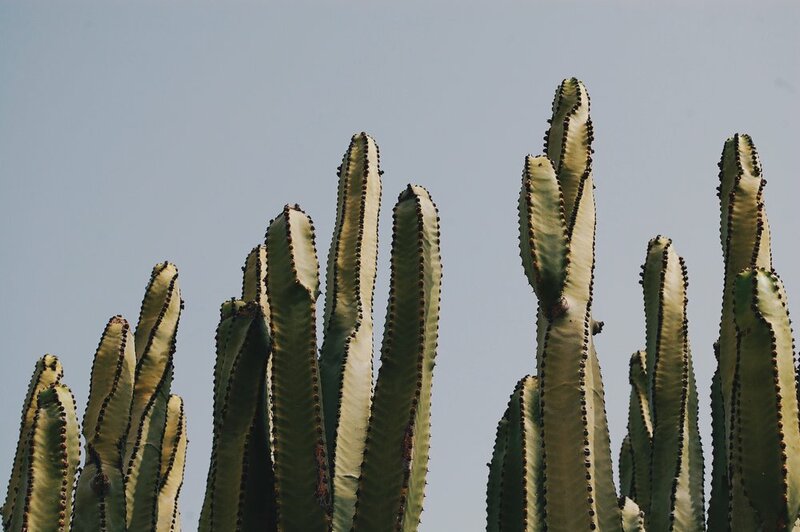 However, El Cerrito’s picturesque hilltop location set amidst large cactus plants is worth a visit not only to explore this important historical site, but to do so without having to compete for the same photo spot with multitudes of other visitors. Much of the same can be said for the entirety of Santiago de Querétaro – it’s a highly underrated city that provides a whole lot to discover for the curious traveler, and it’s really only a hop, skip, and a jump away from Mexico City, making it the perfect side trip or weekend getaway.